The man behind the mask is no American, but 21-year-old Egyptian chef Atef Saad. 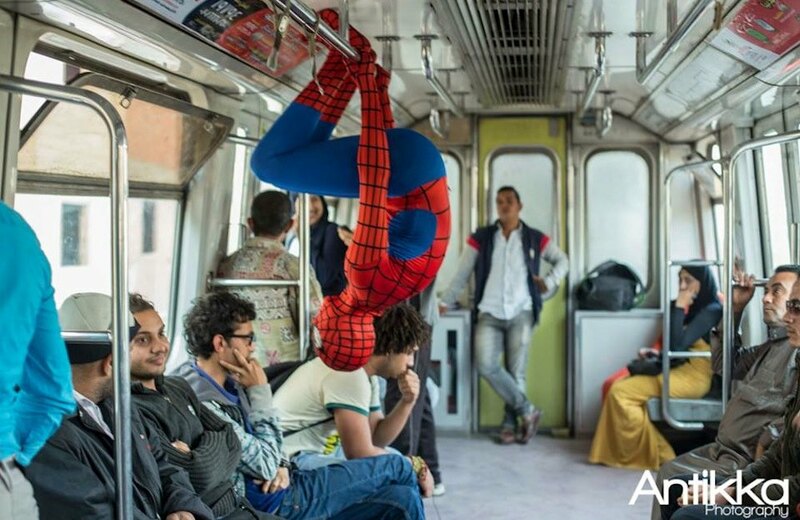 Together with Hossam Atef, founder of Antikka Photography, Mr Saad has quickly become a local social media sensation thanks to the hysterical Spiderman performance. Dressed in full gear, he has roamed the city streets, hanging upside-down in buses and riding on top of taxi cars. It’s the perfect stunt; and while the real Peter Parker took photos of himself (as Spiderman) and then sold them as a photographer who simply claimed to know Spiderman, Mr Saad and Mr Atef enjoy the benefit of working as an actual team. Your Middle East asked photographer Hossam Atef about their initiative: Is it meant to spread awareness of Cairo’s many challenges, like traffic chaos and failing public transportation, or merely a funny way to bring some humor into people’s daily lives? “First thing that crossed my mind is making some fun of how Spiderman will deal with this life that we live here in cairo… we are fighting not living, fighting to catch the bus.. fighting the traffic jams, and even superheroes can’t deal with this – but we do,” Hossam explains.